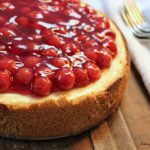 Classic Baked Cherry Cheesecake with delicious graham cracker crust, sweet cherries and creamy cream cheese. A hubby’s favorite and so much easier than you may think! *This post contains affiliate links. You can read our disclosure here. As I am typing this, Christmas is around the corner. 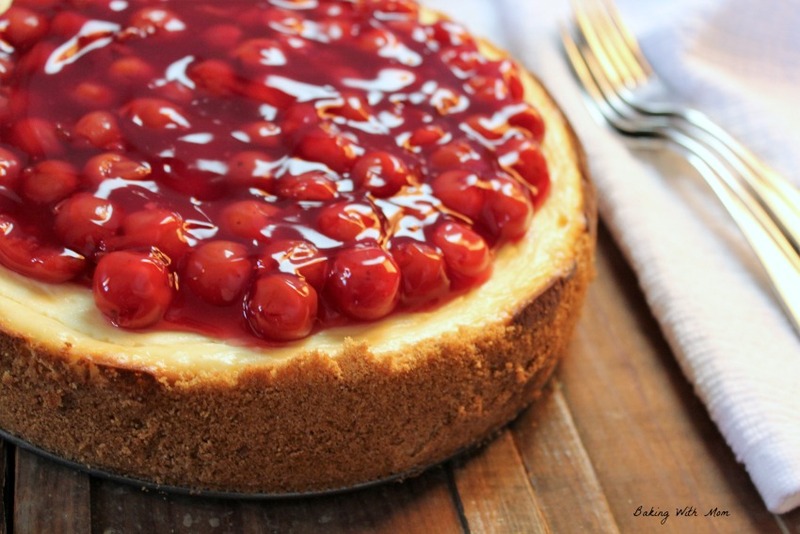 This classic baked cherry cheesecake would be great for the Christmas season to take to family, friends or coworkers. This cheesecake would be fabulous to take to the company Christmas party. 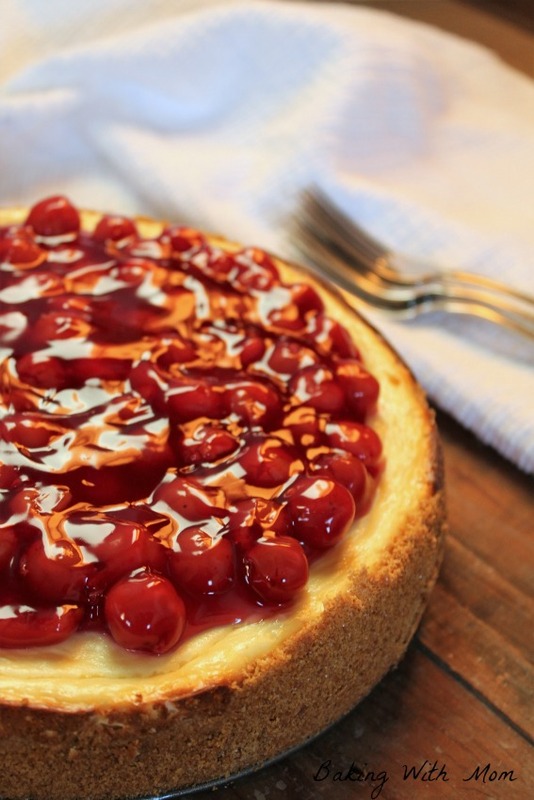 That said, if you are reading this, say in JULY or something like that, you could take this classic baked cherry cheesecake to a 4th of July picnic or a birthday party. It is so good. It is so easy. And everyone will rave about it. I believe there are those that feel a baked cheesecake takes too much time or is way to complicated to make. Trust me, it is not too complicated to make. It really is only a few ingredients and also so versatile. You can easily add OREO cookies, chocolate chips or even raspberries for a twist. Plain cheesecake with a variety of toppings is what the hubby likes so that is what I make the most. Of course, a coffee cheesecake would be rather tasty as well, wouldn’t you say? I have made a Raspberry Cheesecake on Baking With Mom with tips to make the perfect cheesecake. I find letting the cheesecake cool in the oven with the door open really does help prevent cracking on the top of the cheesecake. Of course, if you are spreading cherries on the top of the baked cheesecake, then a crack really doesn’t matter too much. Then again, you know it is there. That is enough to want to prevent the crack, right? Cream cheese : It must be Philadelphia. It just must. You can find this on sale at Kroger regularly. Watch for sales and use their eCoupons for better deals. Sour cream: Any brand will do. 9 in Springform pan : If you don’t have one, I would get one. The pan is also great to use for this delicious coffee cake. 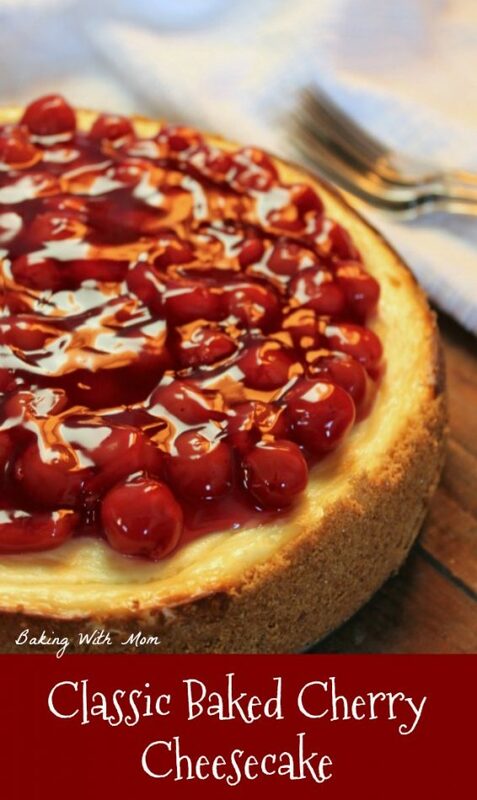 This classic baked cherry cheesecake is so easy to make with only a handful of ingredients. Enjoy homemade cheesecake in your own home. Mix graham cracker crumbs and butter together and place in a greased springform pan. Make sure to place the crumbs up the sides as well. Set aside.